Draft: 2014, Texas Rangers, 6th rd. Jose Trevino…has a son, Josiah Cruz (6/10/18)...was a 3-time all-conference selection at Oral Roberts University, where he was a teammate of former Ranger Chi Chi Gonzalez…selected Summit League Newcomer of the Year following freshman campaign…in 2014, was tabbed as the shortstop on the Southland Conference All-Conference Second Team after earning a spot on the third team as a catcher in 2013…made an in-season transition from third base to shortstop for the Golden Eagles as a junior…is a 2011 graduate of John Paul II High School in Corpus Christi, Texas…tied the Texas state record with 25 home runs during his senior campaign and led the school to back-to-back state titles in 2010 and 2011…had his #21 retired at the John Paul II Baseball Booster Potluck Dinner on 2/11/16. In his only major league stint to date, was recalled from Frisco for a 3-game series 6/15-17 vs. COL and appeared in all 3 games, going 2-for-8 with 3 RBI…both hits drove in runs, including a walk-off 2-run single off Wade Davis in the 9th inning of the Father's Day series finale on 6/17 vs. COL, his most recent MLB game…entered that contest as a defensive replacement, becoming 4th catcher in Rangers history to post a gameending hit with the club trailing…others: Mike Stanley (7/27/87 vs. MIL), Ivan Rodriguez (9/8/98 vs. KC), and Jonathan Lucroy (9/16/16 vs. OAK)…lone start was 6/16 vs. COL, when he posted game-tying single in the 7th for his 1st MLB hit (off Kyle Freeland). Spent season at Double-A Frisco, batting .241/.275/.323/.598 over 105 G and 423 PA's in his 1st Double-A action, lowest career figures in all slash categories…his 9.61 PA/SO was 3rd-best in the Texas League…rated statistically as the top defensive catcher in the Texas League at DoubleFrisco, compiling a .996 fielding percentage and leading all TL backstops in games (99), total chances (829), putouts (762), assists (64), and caught stealing percentage (41.3%, 33-of80)…had just 3 passed balls…selected for a minor league Gold Glove Award for the 2nd consecutive season, and was also Rangers Minor League Defender of the Year…selected to league's midseason and postseason All-Star squads…went 0-for-2 for victorious South team in 6/27 All-Star Game in Frisco. Earned mid-season and postseason All-Star honors in the California League...tabbed the 18th-best prospect in the CAL League by Baseball America…rated statistically as the best defensive catcher on the circuit, leading all CAL League backstops in fielding percentage (.998) and caught stealing percentage (48.0%)…ranked among the league's batting leaders in average (7th, .303), doubles (T8th, 30), and RBI (T14th, 68)… whiffed in just 10.5% of his plate appearances, lowest among all Texas farmhands and 18th-lowest among all qualifying minor leaguers in full season leagues…batted .397/.417/.574 (27-68) vs. left-handed pitchers and .285/.328/.408 (104-365) vs. righthanders…hit .242 (23-95) over 1st 25 games and .320 (108- 338) in final 84 contests…was named the organization's Minor League Defender of the Month for July…batted .375 (12-32) with 2 doubles, a home run, and a club-best 9 RBI over 7 postseason games for the CAL League champion Mavericks. Garnered All-Star honors for the 2nd straight season, earning a spot in the South Atlantic League All-Star Game….made the full conversion to catcher, appearing in 87 games behind the plate for the Crawdads…compiled a .992 fielding percentage (6 E/760 TC) and threw out 31 of 92 (33.7%) of attempted basestealers, 5thhighest percentage in the SAL…ranked among the team leaders in home runs (2nd, 14), RBI (2nd, 63), and doubles (T2nd, 19)… batted .318 (7-22) over 6 games in the SAL playoffs…played in 6 games with the Surprise Saguaros in the Arizona Fall League, batting .217 (5-23). 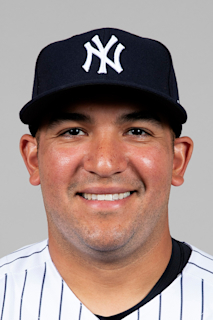 March 19, 2019 Texas Rangers optioned C Jose Trevino to Nashville Sounds. October 2, 2018 Texas Rangers recalled C Jose Trevino from Frisco RoughRiders. June 29, 2018 Frisco RoughRiders placed C Jose Trevino on the 7-day disabled list retroactive to June 27, 2018. June 18, 2018 Texas Rangers optioned C Jose Trevino to Frisco RoughRiders. June 15, 2018 Texas Rangers recalled Jose Trevino from Frisco RoughRiders. June 13, 2018 Frisco RoughRiders activated C Jose Trevino from the temporarily inactive list. June 10, 2018 Frisco RoughRiders placed C Jose Trevino on the temporarily inactive list. May 11, 2018 Frisco RoughRiders activated C Jose Trevino from the 7-day disabled list. April 29, 2018 Frisco RoughRiders placed C Jose Trevino on the 7-day disabled list. March 13, 2018 Texas Rangers optioned C Jose Trevino to Frisco RoughRiders. November 20, 2017 Texas Rangers selected the contract of Jose Trevino from Frisco RoughRiders. May 11, 2017 Frisco RoughRiders activated C Jose Trevino from the temporarily inactive list. May 4, 2017 Frisco RoughRiders placed C Jose Trevino on the temporarily inactive list. January 24, 2017 Texas Rangers invited non-roster C Jose Trevino to spring training. May 22, 2016 Jose Trevino roster status changed by High Desert Mavericks. May 16, 2016 High Desert Mavericks placed C Jose Trevino on the 7-day disabled list retroactive to May 15, 2016. March 29, 2016 C Jose Trevino assigned to High Desert Mavericks from Hickory Crawdads. March 12, 2016 C Jose Trevino assigned to Texas Rangers. October 12, 2015 3B Jose Trevino assigned to Surprise Saguaros. April 1, 2015 C Jose Trevino assigned to Hickory Crawdads from Spokane Indians. March 6, 2015 IF Jose Trevino assigned to Texas Rangers. June 10, 2014 C Jose Trevino assigned to Spokane Indians. June 9, 2014 Texas Rangers signed 3B Jose Trevino.